This feature article focuses on the conditions for the 1927 world title match, and particularly on whether they contained a 5-5 clause. Several times in Garry Kasparov on My Great Predecessors Part I it is stated that if a 5-5 score had been reached in the 1927 world championship match between Capablanca and Alekhine the contest would have been drawn. Scepticism about this has been expressed, and Kasparov has acknowledged (in his interview with Hanon Russell at the Chess Café) that the claim may be unfounded. Here we provide an overview of the issue. The Buenos Aires match was the only one played under the London Rules, which had been agreed upon on 9 August 1922 by Capablanca, Alekhine, Bogoljubow, Maróczy, Réti, Rubinstein, Tartakower and Vidmar. They were published on pages 133-134 of the November 1926 American Chess Bulletin and pages 125-126 of the January 1927 Chess Amateur. We believe that the first book to reproduce the full text was our 1989 volume on Capablanca. c) Capablanca and Alekhine had a prior agreement that if the match reached 5-5 it would be drawn. The question asked by Claus van de Vlierd about documentary evidence was certainly the right one. In particular, it may be wondered when the 5-5 condition first appeared on paper. The earliest occurrence we have found so far is on pages 47-48 of Kapablanka by Vassily Panov (Moscow, 1959), and we shall be pleased to hear from any reader who can help us trace it back further. Concerning the unresolved issue of whether a 5-5 clause was in force for the 1927 world championship match, C.N. 3013 reported that the earliest such claim we had found was on pages 47-48 of Kapablanka by Vassily Panov (Moscow, 1959). However, Louis Blair (Carlinville, IL, USA) now informs us that at Kasparov’s new ‘Chesschamps.com’ website a contributor, Tapio Huuhka, has pointed out an earlier occurrence, in Max Euwe’s book Meet the Masters. This find is of much interest and prompts us to make a number of observations. This statement (made, let it be noted, when Alekhine and Capablanca were still alive) is of evident importance because of the stature of Euwe, a former world champion who had frequently conversed with both Alekhine and Capablanca in the 1930s about world title match conditions. There are, though, complications to be examined. 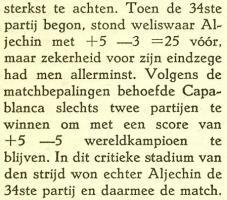 Another book which discussed the closing stages of the 1927 world championship match was Het Schaakphenomeen José Raoul Capablanca by M. Euwe and L. Prins (The Hague, 1949), but the chapter on the contest (pages 153-173) made no mention of any 5-5 clause. Although that section was labeled as having been written by Euwe, doubts subsist, for in a letter to us dated 22 October 1987 Prins referred to “my” Capablanca book (I did most of the work including literary and analytic research)’. 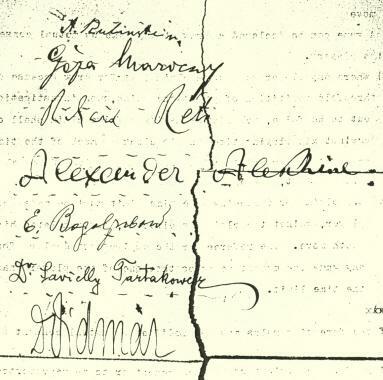 Since it is impossible to determine exactly what Euwe himself did or did not write in the various books bearing his name (or to know the extent to which he verified his helpers’ input/output), further investigation of the 5-5 affair will, we suggest, need to cover the writings on the 1927 match of all three of them, i.e. Euwe, Kmoch and Prins. We finish for now with the most peculiar aspect of this new ‘Euwe twist’. As noted in C.N. 3013, the possibility of a 5-5 condition was first discussed in C.N. after the late Božidar Kažić of Belgrade had informed us, in a letter dated 14 October 1984, that during the 1978 Karpov-Korchnoi match in Baguio he had been told regarding the 1927 match, ‘It is not true about 5-5; it is the imagination of journalists’. 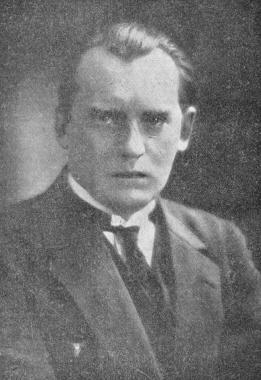 The person who made that statement to Kažić was Max Euwe. Niall Murphy (Galway, Ireland) enquires about the financial conditions for the 1927 world championship match. We are grateful to Mr Sánchez for scouring the Argentine press for further information, and particularly about the unresolved issue of whether the match would have been drawn if the score had reached 5-5. In the presentation below we provide English translations of the key passages from the various newspaper reports found by Mr Sánchez, and our own remarks are in square brackets. Mr Sánchez’s commentary is in italics. “Dice Capablanca: ‘El reglamento del match será a seis partidas ganadas sin limitación de las a jugarse.’ Esto dio motivo a que se hiciera alusión a la interminable cantidad de partidas tablas que tuvieron lugar en su match contra Marshall, en el cual demostró visible superioridad sobre el campeón norteamericano. “Las condiciones finales [del match] quedarán fijadas una vez que el dr. Alekhine llegue a esta capital, en una conferencia con Capablanca y las autoridades del club organizador. “Cap. Fed., 13: Dice Capablanca que efectivamente cablegrafió al Club de Ajedrez de Nueva York para que organice otro match con Alekhine, sea cual fuere el resultado del que está en disputa. “¿Match revancha entre Alekhine y Capablanca? Habiéndose hecho público que Capablanca escribió durante el desarrollo del match una carta a los dirigentes del Club de Ajedrez de Nueva York sugiriendo la concertación de un match revancha para 1929, lo que nos confirmó el propio Capablanca, interrogamos al nuevo campeón sobre el particular. El dr. Alekhine declaró que en 1929 tendrá sumo placer en jugar un match revancha siempre que Capablanca vuelva a desafiarlo oficialmente y conforme al convenio de Londres. Naturalmente, agregó, ese nuevo encuentro tendrá que jugarse en las mismas condiciones en que se realizó el actual pues si yo gané el título jugando más de 30 partidas sería ilógico que lo pudiese perder por un punto en un match a 20 partidas por ejemplo. 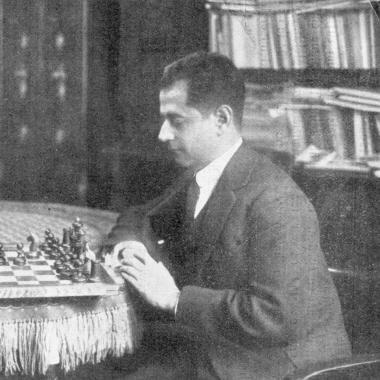 Si fuese desafiado por Capablanca y al mismo tiempo por otros maestros, daría la preferencia a Capablanca, pero, agregó Alekhine, con la sola condición de no jugarlo en La Habana, por razones de clima; por ejemplo, en los Estados Unidos me sería muy grato jugarlo. Desafiado por otros maestros, el nuevo campeón podrá limitar el número de partidas a jugarse. [The above report states that Alekhine told the newspaper that he would have the greatest pleasure in playing a return match on condition that Capablanca challenged him officially in accordance with the London Rules. The terms would have to be the same because he had played more than 30 games to win the title and it would be illogical, Alekhine said, for him to be able to lose it by one point in, for instance, a 20-game match. If he was challenged not only by Capablanca but also by other masters he would give preference to Capablanca, the only condition being that he would not play in Havana, on account of the climate. If challenged by other masters, Alekhine said that he might limit the number of games to be played. The final paragraph of the above report states: ‘Alekhine added that the former world champion defended admirably in the final game and that it was a matter of satisfaction for him to say that Capablanca had played on until the end of the match, i.e. he did not give up until Alekhine had gained the six points indispensable for winning the match.’ Mr Sánchez comments that that last paragraph reduces the likelihood of a 5-5 clause. So where does all this leave matters? It might be expected that the above-mentioned 13 September 1927 meeting of the players and the committee would have resulted in a document being signed to cover the final terms for the match. Do any such archives exist?